Norton Security Scan has just released version 2.7 with several improvements over the previous editions. The first and the most obvious improvement, is a complete revamp of the interface. If one is familiar with the new 2010 Norton antivirus products, a user will be able to easily find and start all of the Security Scan’s functions. Interestingly, since Norton Security Scan 2.7 is freeware vs. Internet Security etc. it actually makes the software easier to use. The core functions of the program are easier to access than antivirus with hundreds of different features. Most users just want to perform a virus scan and let the program handle the myriad of antivirus checks automatically; Norton Security Scan 2.7 is perfect for this task. Upon installation of Norton Security, a lot of things are done automatically. The first is that the virus definitions are automatically updated without any intervention from the user. Most free antivirus may not even download the latest definitions before a virus scan is started. 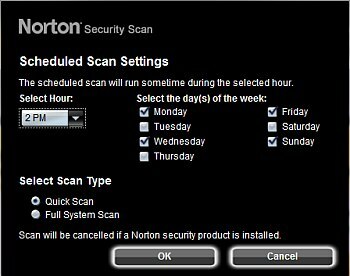 Next, Norton Security Scan 2.7 automatically creates scheduled scan options that are automatically scheduled every day at a specific time period. The scheduled tasks can be found in the Windows Task Scheduler or accessed conveniently within the program. The advantage to this approach is that the schedule can be easily adjusted and that Norton Security Scan 2.7 doesn’t require a persistent Windows service or process in memory. This means that Security Scan 2.7 has no problem running with other antivirus that do have resident shields etc. Firstly, it isn’t possible to get anything equivalent Norton Security Scan’s protection in competing free antivirus. A quick search on the web and antivirus comparison websites will show that AVG, AVAST, AVIRA, and MCAFEE cannot even come close to Norton’s Detection Rates. Norton’s 2010 products have won all major awards in 2010 including the best antivirus award by the venerable PC Magazine and AV comparatives websites. And even though Norton Security Scan 2.7 is freeware, it still utilizes the same detection engine and the same virus definitions as the award winning retail versions. New to the 2.7 version is the addition of the Norton Insight or behavioral and collaborative scanning capability. All 2010 Norton Antivirus and Internet Security products come included with the Norton Insight protection. Insight thoroughly scans every Norton users computer and classifies all files as trusted or non trusted based upon scan results uploaded from millions of individual computers. This information is then utilized to find unknown viruses or zero day threats before a virus definition is even released. Many competing antivirus are now offering Insight like protection, but take a moment to consider the resources that Symantec (the global leader in antivirus software) offers over free antivirus competitors with just a few hundred employees and a shoestring budget. Symantec has the intellectual resources and some of the most advanced servers to send antivirus definitions to millions of computers in intervals of up to every 5 minutes. I am not aware of any other program let alone Windows Update that can update that frequently. Just imagine Symantec’s internet bill every month. 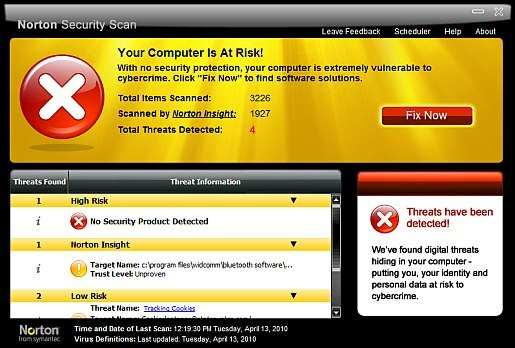 Now consider that Norton Security 2.7 is a completely free antivirus and the value associated with it. A full system scan with Norton Security Scan 2.7 only took 7 minutes to complete on the test system. This scanning time easily beats 98% of competing antivirus on the market. In addition, during a scan, Norton uses about 86 megabytes of memory and about 22% CPU power. Again, in comparison to other security products this is extremely efficient resource management and an area that Norton has made giant strides when compared to previous versions. Norton can no longer be labeled as a resource hog.